Becoming an interior designer can be a very good career choice for anyone and studying for our interior designer course will provide you with the necessary knowledge to launch a career. The creative industry is currently the fastest growing industry in the UK, so a career as an interior designer is highly desirable. Throughout this interior design qualification we will be exploring various different units aimed to prepare you to work as an interior designer and launch your own business. Understanding the art of using colours, materials and lighting in different spaces is key to working in the design industry and developing the creative eye will give you the ability to design areas for many different clients. 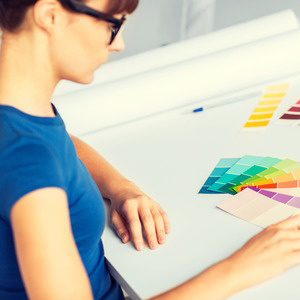 This Interior Design Level 3 course is designed to give students the knowledge and understanding of the design sector and develop their skills to work as an interior designer. It explores the main concepts of design and addresses the skills which are used to produce stunning doom designs for clients. Working with interiors, finishes and furniture is also covered in this course and we will explore many different techniques in order to plan an interior design project from conception to finish. Upon completion of the qualification you will have developed a much better understanding of the entire design process and have the knowledge to begin working as a designer. Being able to successfully manage an interior design project is just as important as being able to design and plan all of the individual objects to be used in the space. The ability to plan and schedule your projects will enable them to be achievable and break the entire design process down into manageable sections. Using carefully structured plans and breakdowns you will be able to progress your projects in the most efficient manner and in this unit we will explore many different planning processes that need to be employed with each new project. Two of the most basic area of interior design are proportion and space. Being able to plan out different rooms to enhance the area and ensure that space is used as efficiently as possible will enable you to make the area appear much larger. Having the right furniture and proportions in the space will allow you to increase accessibility and keep the perfect sizes for the purpose of the space. Throughout this unit we will explore ways to use the space we have and get the most from this while always keeping within strict building regulations and codes. This is a skill which all interior designers must master and will help you to develop great plans even if there is not much room to work with. Understanding the link between colour, surfaces and the feel of a room is very important so that you can develop your eye as an interior designer and begin to make the space perfect for your clients. In this unit we will explore the use of different colours in interior design and how contrasting or blended colours can give different effects. We will also look at various surfaces and materials that are used to add aesthetics to a room and tie in the furniture and fittings. Knowing the best materials and products to use in different areas of the house or workplace is key to using aesthetics to ensure a room is perfect to the very fine details. Being able to provide a comforting and suitable environment within a room is just as important as the décor and visual character created. Having the right light levels, temperature, humidity and air flow is essential for any room and in this unit we will explore this concept. Light is used throughout the work of an interior designer and can be either natural or artificial, so it is important to understand the use of light and how to integrate this with other aspects of your work. As an interior designer you will not be tasked with installing heating and lighting systems but you will need to work with those who are and ensure that they understand and share your vision for the space. You will need to be able to appreciate the use of these devices and find ways to conceal or disguise certain vents and radiators to ensure that these systems are in place and working, but the focus is on the aesthetics of the room. Understanding various elements of interior design is important for you to be able to work in an efficient and carefully structured manner. Being able to lay out a room and accessorise spaces will be explored in this chapter and we will also look at some resources which interior designers use on a regular basis that help with their duties and allow them to produce designs of the highest calibre. This unit will explore decorative accessories as well as the resources required for you to put your design skills into practice. Being able to design interiors is a complex and difficult role that requires commitment, personal skills and listening abilities. In this final unit we will assess ways in which the interior designers can identify different solutions to provide great customer service to clients. We will look at the key qualities that are needed for any interior designer to succeed in the work place and earn a great reputation in the industry.